Luke is a 24-year-old video editor from Cape Town with a keen interest in music and storytelling. After completing his honours in Film and TV studies, he worked as a freelance editor (and videographer where necessary) for about 6 months before joining a production company in Woodstock where he is still employed (Little Big Productions). 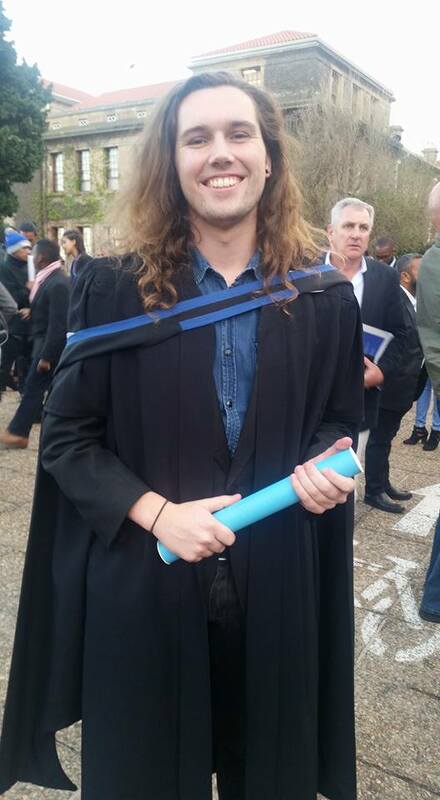 Luke explains that, “While at UCT, I was not enrolled in any of the production streams for Film and TV (because of various time-limiting factors, mostly having to work part-time through my studies), so when I left UCT I had almost no practical training or experience. In my Honours year and first few months of work, I managed to teach myself many of the crucial skills needed to work as an editor (using the access I had to Lynda.com through UCT), and have been working successfully as one since. This would have been a much more challenging task without the fantastic theoretical groundwork I had gained from my studies. Luke describes his fondest memories at UCT as “My honours year in general - I was given the opportunity to write a dissertation on a topic of my choice, was presented with fantastic material to discect all year, and had a fantastic class who engaged in active and engaged discussion with the course material”. His advice to incoming students is, “Even if it may seem like a particular course or module doesn't peak your interest or intersect with your passions, use that as an opportunity to engage with ideas you may have otherwise missed out on. Some of the most engaging material in my studies came from courses or sections I was unsure about studying in the first place, and more often than not it took a bit of pushing myself through it to figure out that I actually enjoyed it”.